Papago Park is a great place to go if you have never explored the desert, or if you are looking to get in shape. The first 1/2 mile of the trail heads from the parking lot towards the rocks. For this C-5/6 quad, its a helluva push. At the base of the rocks, there is a nice ramada which offers some great views of the metro-Phoenix and a place to catch your breath. Beyond this point, the trail enters some steep terrain. We naturally went, but I was getting a turbo boost back up a few slopes. The asphalt trail is wide and smooth which makes for a nice ride. There is water at the bottom, but this is one trail you’ll be wanting to stop for water just so as you can catch your breath. Sunsets and moon rises at Papago Park are very vibrant. Unfortunately my camera is in the shop so we didn’t capture what we enjoyed. But you can get a taste of it at Flickr’s Arizona Group. Papago Park is located on the borders of Tempe, Scottsdale and Phoenix. Within the park is the Phoenix Zoo and the Desert Botanical Gardens. The trailhead is located on Papago Park Road on the west side of Galvin Parkway just opposite the zoo turn off. 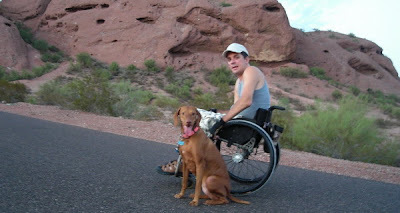 We just took a stroll on Papago Park Trail in Phoenix. This is a great place for people in wheelchairs, or with any type of disability to get some excercise. Excellent view!!! I found your site w/ a search, it is awesome! !